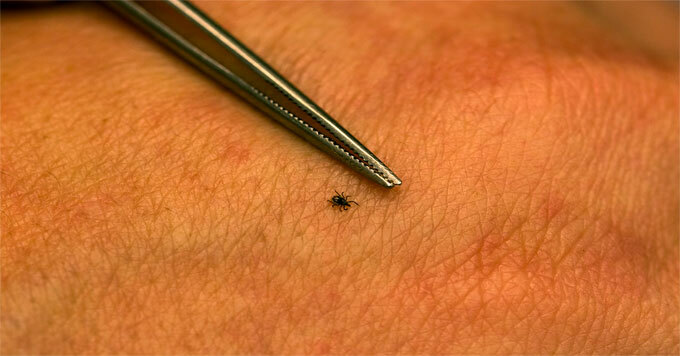 An infestation of disease-carrying ticks as the climate warms. A nymphal blacklegged tick (Ixodes scapularis) that carries Lyme disease. Photo: Courtesy of Cary Institute of Ecosystem Studies. Summer brings sunshine, shorts, and sandals to the northern U.S. It’s wonderful to get outside, but a hidden danger lurks: disease-carrying ticks. In the ’80s, about 1,500 cases of Lyme disease were reported annually in the U.S. Currently, the average is 30,000, but the Centers for Disease Control and Prevention estimates there may actually be as many as 300,000 cases per year, mainly in the Northeast and upper Midwest. Richard Ostfeld of the Cary Institute of Ecosystem Studies says climate change is partly responsible. Warmer temperatures allow ticks to spread farther north and to higher altitudes. Earlier springs have an impact too. That can catch people by surprise, even in areas where ticks are common. Early signs of Lyme disease may include flu-like symptoms and a rash. If left untreated, the symptoms become more serious, so early intervention is key. Reporting credit: Rosie Simon/ChavoBart Digital Media. What is the best predictor of annual lyme disease incidence: Weather, mice or acorns?